Blue Systems International is the leading private investigations firm in Orange County, Ca. #BSIPIFirm has the most advanced tools and tactics that can handle and address any type of case making the PI firm one of a kind full-service agency that is licensed, insured and bonded. Visit http://www.nowpi.com for more information. We have access to the most advanced and sophisticated tools and systems in the investigation industry. Thus, we are able to provide our clients with accurate and outstanding results. In addition, our investigative efforts reach throughout the United States. Therefore, allowing BSI to conduct international as well as comprehensive background checks upon demand. All of our agreements and contracts bind the firm with a confidentiality clause and all of our clients’ information is kept confidential at the highest level and priority. Likewise, all of our communication is through a secured system on our website making the availability, integrity, and confidentiality of your content fail-safe. 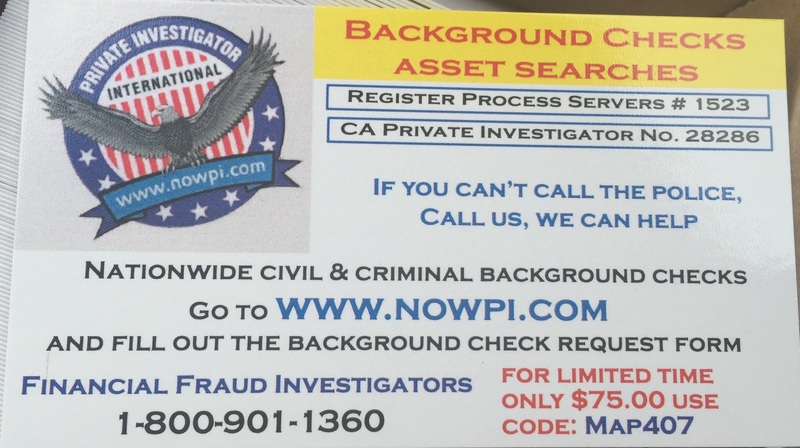 Comprehensive background check and criminal record search: Nationwide and International specialists. 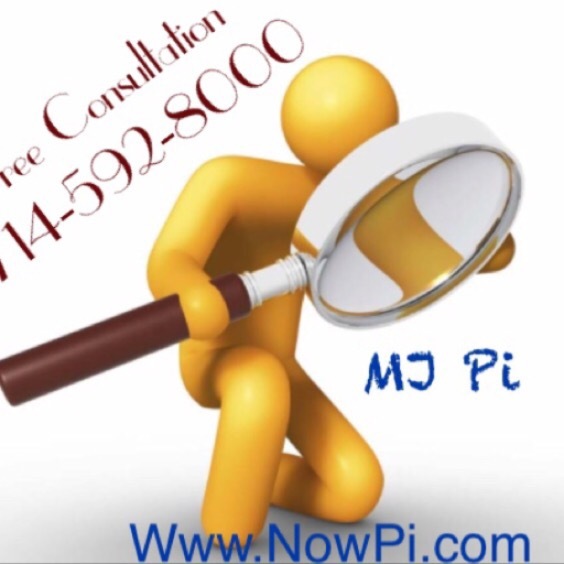 Ask a PI in order to learn how we can help with any legal problem ? Assets, Arrests, Criminal Records, Past \& Present Addresses, Relatives, Judgments \& Tax Liens Driving Records and More! It has been always my pleasure to help out clients in a time of need and it’s one of my main drives to being a private investigator. In every case, the first reward for me is to protect my client, report the truth and exceed the client’s expectations. A private investigator work is rather complicated and no simple, as we all have watched on various TV Shows such as Simon & Simon, The Rockford Files, Remington Steele, Mike Hammer and Magnum PI. While the Los Angeles Police Department can investigate a crime, they can’t get involved in unclear or civil matters and will always require more evidence to move forward with criminal charges. When you need a rigorous investigation that meets your exact needs, turn to a licensed private investigator, insured and bonded, at Blue Systems International. All Private investigators are well trained in law enforcement, investigation, and paralegal services. We use advanced investigative techniques to uncover the truth. You can rely on our complete investigative services, including conducting surveillance, handling evidence, and questioning witnesses. We utilize polygraphs and other complex investigative technology. Most of our employees formerly worked in law enforcement or the military and have many years of investigative experience. Whether your case involves a missing relative, stolen belongings, or a deceitful friend, you deserve to know what’s really going on. We carefully examine each piece of your case and turn a jumbled puzzle into a clear picture. 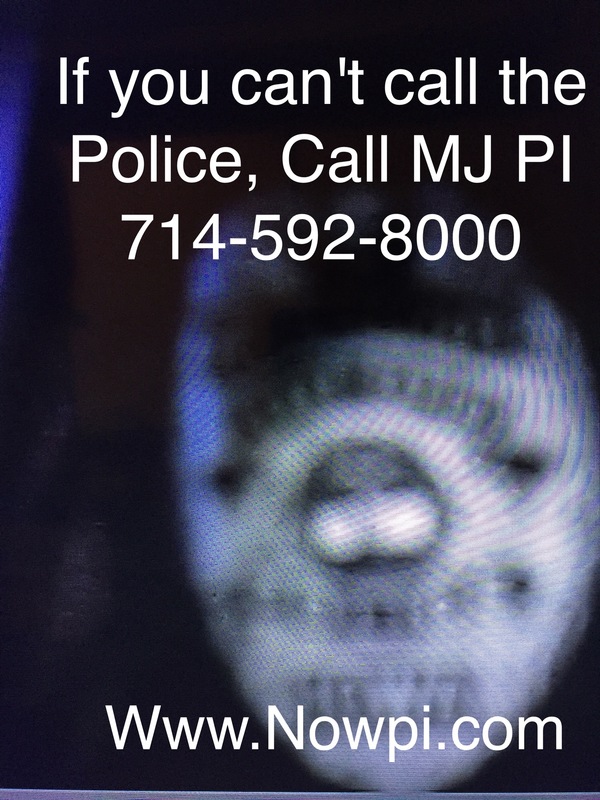 Call us today at (714) 592-8000 for a free consultation with a private investigator. Newport Beach Private Investigator speaks out. My greatest strength is in my willingness and ability to treat the companies I work for as if they were my own business. I often take on additional responsibilities, persist in making sure things are done correctly, help pick up the slack when shorthanded, and put everything that I am into my work. I consider myself to be a consummate professional and only feel satisfied when my work has helped make the company I work for more successful. I take great pride in being part of that success, no matter how small. Honestly, I would have to say that my greatest weakness is the same as my greatest strength. Because of my dogged determination and work ethic I have a tendency to work long hours and a few unscrupulous employers have taken advantage of my work ethic. My willingness to do more than my part and to do whatever is necessary to help the business I work for has led to some situations in which I was overworked, underpaid, and underappreciated. Collect your Judgment today by utilizing a licensed private investigator. In today’s laws and regulations, banking and financial information is prohibited from the public; Therefore, you must hire a Private Investigator in order to help you collect your judgment. Judgment collection is not an easy task, however it can be done with the right tools, intelligence and research. Time is not on your side when collecting a Judgment since it’s a lengthy process that must be started immediately in order to secure good results.